Today is a yummy one! Everyone needs great basic brownie recipe. Its a staple, kind of like having flour or sugar on hand. And this recipe doesn't disappoint. Its simple, easy and perfect every time! 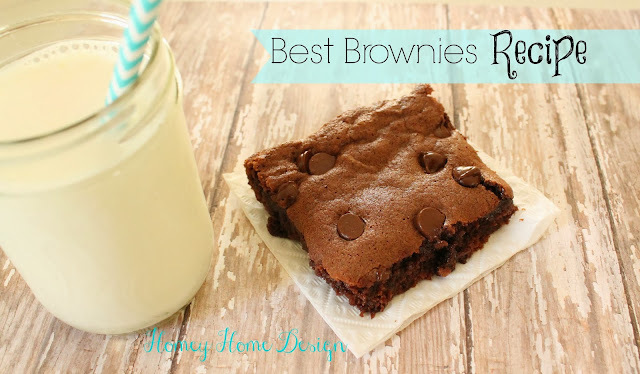 The great thing about a basic brownie recipe is that you can customize it to your liking. If you want nuts, add nuts. If want to add candy bars, chop em up and throw em in! We like chocolate chips on top! Start by preheating your oven to 350 degrees. Then grease a 9x13 pan. Melt 2/3 cup of butter and mix it in with your sugar and cocoa. Real butter makes a big difference, if you have some this is what you will want to use. cake-y and more fudgey/chewy. Mix well. and mix until smooth and well combined. Bake for 25 minutes, cool and serve! They are so good! They beat a box any day! Oh, and you will certainly need a large glass of milk!